June 14, 2012 - The Eurocopter X3 hybrid aircraft has arrived in the United States for a month-long tour to demonstrate this advanced high-speed transportation system’s unique operational capabilities for both civil and military operators. Transported aboard a chartered cargo jetliner, the X3 touched down in Texas to complete its trans-Atlantic crossing from France’s Istres Flight Test Center. The hybrid aircraft will be based at the Grand Prairie, Texas headquarters of Eurocopter’s U.S. subsidiary, American Eurocopter, in preparation for the X3’s official U.S. tour and debut on June 20. During its American tour, the X3 will visit five locations for presentations that will showcase its exceptional combination of a helicopter’s full hover flight capabilities with cruise speeds of a turboprop-powered aircraft. In addition to aerial demonstrations performed with Eurocopter’s test team, the X3 will be available for flight evaluations by selected U.S. armed services personnel and civilian operators. In testing to date performed from the Istres Flight Test Center in southern France, the X3 easily surpassed its original speed target of 220 kts. ; reaching more than 230 kts. in level flight while using less than 80 percent of available power. Beyond confirming its excellent flight qualities, maneuverability, outstanding acceleration and deceleration capabilities, the hybrid aircraft has shown exceptional climb and descent rates along with very low vibration levels – all without any need for passive or active anti-vibration systems. “After our highly successful flight trials in Europe, the United States tour will underscore the maturity of Eurocopter’s answer for applications where mission success depends on short flight duration through maximum cruise speed at reasonable operational costs,” said Lutz Bertling, Eurocopter’s President & CEO. The X3 demonstrator is equipped with two turboshaft engines that power a five-blade main rotor system and two propellers installed on short-span fixed wings. A wide range of utilizations are envisaged for this hybrid configuration, including long-distance search and rescue (SAR), coast guard duties, border patrol missions, passenger transport, off-shore airlift, along with inter-city shuttle services. It also is well-suited for military missions in special forces operations, troop transport, combat SAR and medical evacuation – benefitting from the combination of higher cruise speeds with excellent vertical takeoff/landing performance. 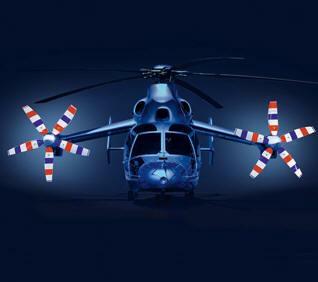 Eurocopter advanced the hybrid configuration from concept to first flight in less than three years. After going airborne for the first time in September 2010, the aircraft’s flight envelope was quickly opened – reaching the initial speed objective of 180 kts. (333 km/hr.) in level flight only weeks later. Flights resumed in March 2011 after a planned upgrade to integrate the definitive gearboxes for operations at full power, with the X3 easily surpassing its original speed target of sustained cruise speeds in excess of 220 kts.